Posted in Nutrition on June 9, 2012. Last modified on March 26, 2019. Read disclaimer. Childhood obesity in America has more than tripled in the past 30 years; and with this weight gain comes serious immediate and long-term health concerns: increased risk of heart disease and stroke, higher cholesterol levels, higher blood pressure, increased risk of diabetes, bone and joint problems, sleep issues, social repercussions, greater risk of osteoarthritis and even a greater likelihood of developing many types of cancer. Unfortunately, 1/3 of U.S. children are now overweight or obese. While we often think of the types and amount of food we eat, our physical activity level and genetics as the most important weight factors, many studies suggest that there is "an association between obesity and consumption of soft drinks." American consumption of soft drinks has increased by 500% over the past 50 years. Sodas (and to a lesser extent, sweetened juices and sports drinks) now account for 48% of the added sugars the average American child's diet. Note 1: in addition to the calories that come directly from drinking soda, afterwards, rapidly falling blood sugar levels have been shown to stimulate appetite. So, we tend to eat more. This also may contribute to weight gain. Note 3: With New York City proposing a ban on restaurant sale of soft drinks larger than 16 ounces, Coca-Cola took a different view of the correlation between sodas and obesity. Read Coke's response, in an interview with USA Today. Question: Since the average 12 ounce soft drink contains around 160 calories, how far would an a 154-pound person have to walk (at moderate intensity) to burn off the calories from just a single soft drink? So, if we are taking in more calories than our bodies need each day and sweetened soft drinks may be partially to blame, what are the alternatives? Question: How many calories does a person consume drinking a 12 ounce glass of water flavored with a slice of lemon? Regular water is, perhaps, the best alternative to sodas. There is no better thirst-quencher. Plus, water is healthy, free and contains no calories. Keep a bottle of chilled water with you and sip often, including with meals. Add a splash of flavor to water by adding a slice of lemon, cucumber or lime. Dilute juices with seltzer (or regular) water. Just like regular water, "fizzy" water has no calories. Drink skim milk. While a glass of whole milk contains 150 calories, that same glass of skim milk has only 86 calories. And, instead of empty calories, milk provides protein, calcium and vitamins needed by a child's growing body. Don't switch from sodas to fruit-flavored punch, sweetened tea or lemonade, sports drinks, energy drinks or gourmet coffees. All of these contain added sugar, may be high in caffeine, and almost always are low in nutrition. If you're going to drink soft drinks, drink smaller amounts and less often. If you're craving a soda, make it a single-size serving rather than "super-size." And, obviously, cutting down on the frequency helps, as well. Make healthy choices convenient. Do not keep soft drinks in your home. And keep sugar in the cupboard rather than on the counter or table. Drink unsweetened iced or herbal tea -- just don't add sweeteners like honey or sugar. Even though 100% fruit or vegetables have naturally occurring sugars, they at least contain nutrients. Just be sure to drink them sparingly. Read labels. Choose the beverage option with the lowest sugar and be aware that a single bottle often contains several servings per container. I just happened to be reading the August 2013 National Geographic article about our sugar addiction and was surprised that, for all the attention given to sugar in our diet, the US isn't even close to being the world's top consumer. The article says we eat an average of 77 lbs per person per year but Brazil eats a whopping 122 lbs! I wonder where the Brazilians stand in terms of obesity? I agree, Phil -- it is hard to believe that Brazil could possibly consuming more than 1 1/2 times as much sugar as we are. To answer your question about where Brazil stands compared to us in terms of obesity, I found a country by country ranking from the CIA, of all places. The US comes in at #6 with an obesity rate of 34% (which is far lower than American Samoa, which tops the list with 75% of their population considered to be obese). Brazil is not listed in the top 10.
sedentary lifestyle: driving rather than walking, sitting for hours in front of a computer or TV, etc. environmental factors: work schedules, super sized food portions, limited access to healthy foods, etc. medications: certain medications can slow metabolism, increase appetite, or cause water retention. emotional factors: such as eating when stressed or bored. stopping smoking: nicotine increases metabolism... plus, foods just taste and smell better after quitting. age:	a decrease in energy and metabolism, menopause, etc. can contribute to weight gain. sleep deprivation: people who sleep less are more likely to reach for carbs and sugars for energy. sleep also affects our hormones. 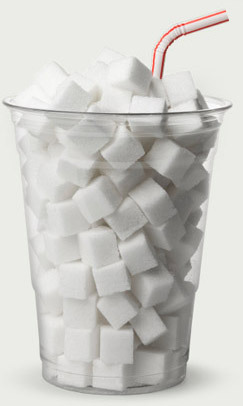 Your article mentions the obesity risk and how soft drinks are a big contributor of added sugar in our diet. But you may also want to mention how horrible soft drinks are for our dental health.